Smoky Beef-and-Bacon Chili featuring Anchor Steam Beer. What could possibly be better than beer and bacon? 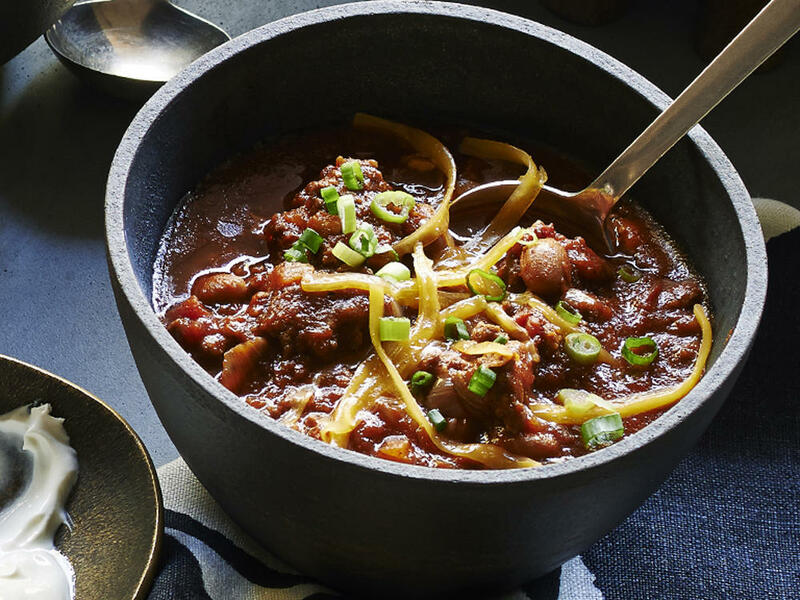 Our friends at Sunset recently came up with this recipe for hearty Beef-and-Bacon Chili featuring our own Anchor Steam Beer and we couldn’t resist sharing. Not only is this crowd-pleaser incredibly easy to make, but it tastes even better the next day! In a large, heavy-bottomed pot over medium-high heat, cook bacon, stirring until it just begins to brown, about 4 minutes. Add onion, lower heat to medium, cover, and cook, stirring occasionally, until translucent, 4 to 7 minutes. Uncover pan, stir in garlic, and cook 1 minute. Increase heat to medium-high and add ground beef; break it up with a wooden spoon and stir gently until it loses its raw color, 7 minutes. Stir in spices and 1 tsp. salt and cook 1 minute. Add tomatoes, tomato sauce, beer, and Worcestershire and bring to a boil. Reduce heat to medium-low, cover partially, and cook 30 minutes. Add beans and cook 10 minutes, uncovered. Season to taste with salt. Serve warm, with toppings on the side. This just looks ridiculously delicious!! I am definitely going to try this with one of our Table Pleaser Belgium ale!! Thank you for the recipe!! Visit our Brewery. Reserve a Tour! Be a brewery insider and keep in the know. contact | privacy | sitemap | trade | mobile © 2019 Anchor Brewing, All rights reserved. a FINE site. Sign up to recieve the Anchor Brewsletter and become a brewery insider. We'll never share your email address, honest!